Although the south coast of Cornwall does not quite the same exposure to the full power of the Atlantic as the north coast it has some of the best and (suprisingly) most powerful breaks around. Also the conditions required to create good waves on the south coast are different so if the north coast is huge and howling onshore then you might get a decent wave on the south. 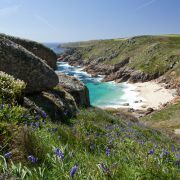 Just round the corner from Land's End, PK picks up more swell than most beaches further up the coast. With it's south facing aspect and high cliffs it is kind of offshore on most winds from E-NE right round to NW. The banks here are quite a limiting factor and the place is only really worth checking on big low tides - that is unless you are fond of neck-breaking shorey! 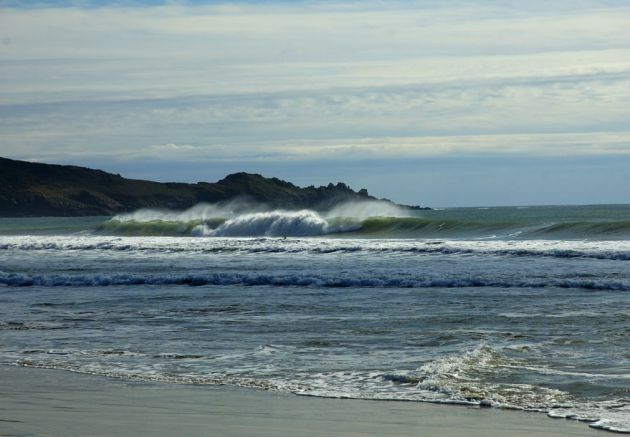 On a good today Porthcurno produces extremely heavy hollow waves, lefts more often or not. It is in fact one of the heaviest waves around and has broken a few boards in it's time. I know one story about a guy getting rogered by the fin of his board here and having an embarassing time explaining what happened at casualty!! 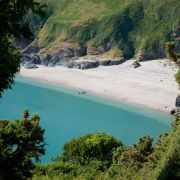 The next beach after Marazion is Perranuthnoe. Generally the surf here isn't too spectacular as it's fairly sheltered from any west swell. 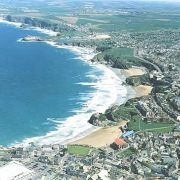 It does have it's days though, mostly in winter when Praa Sands is out of control or looking a bit ugly. The ideal conditions here are pretty similar to those at Praa Sands, the difference is Praa is more exposed and a mcuh better break overall. When Perranuthnoe is working there are usually 2 or 3 decent peaks towards the west end of the beach. It doesn't quite pack the power of Praa or Porthcurno but there are hazzards here such as trying to get out at high tide - this can be real fun scabbling over the pointy boulders in front of the cliff! There are a few good secret spots around here but you'll have to find those for yourself! 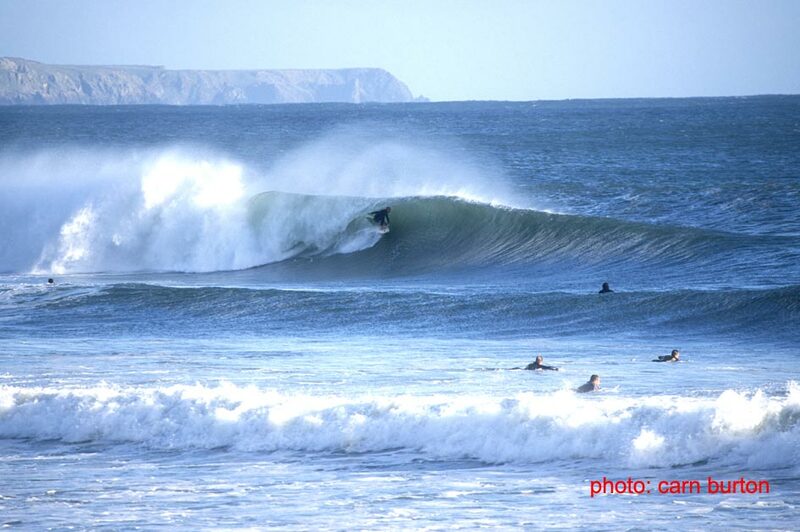 Praa Sands is a quality wave when it's working. 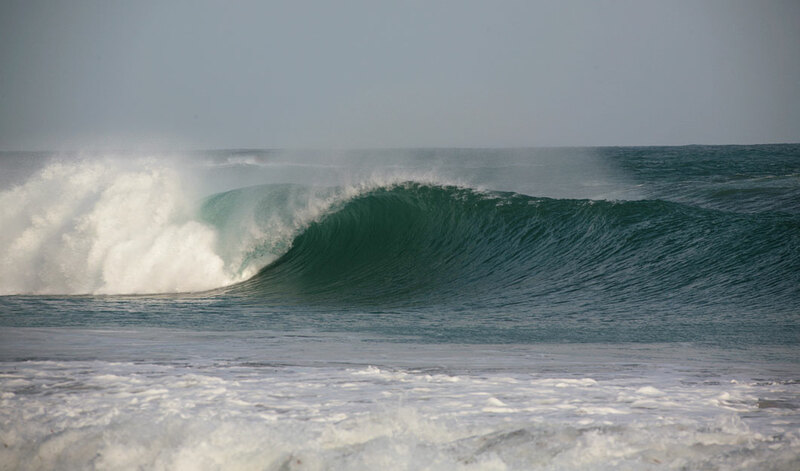 Often provides a really heavy, barelly wave near high tide, breaking close to the beach. On the down side this is probably the most popular beach on the south coast and get's packed whenever there's a south coast swell and northerly wind. Generally the best wave is right out in front of the Sand Bar at high tide although at a lower tide there can be some decent waves closer to the cliffs. It seems most days not much goes no between this end and Hendra at the other end on terms of waves. Praa handles a reasonable size swell, I've seen it surfable up to about double head high, but it is heavy. The classic story is about Pete the Yank wiping out, thinking where's my board only to find it bungee-ing back, tail first into his eye - ouch!! Possibly the best wave in Cornwall when it's good - pretty good when it's not classic aswell. As you'd find out as soon as you looked at it Levy is a reef, a jagged, bumpy, barnacle encrusted reef. It also get's quite shallow and is by it's very nature heavy. So what I'm trying to say is it's not ideal for beginners. 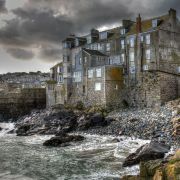 Porthleven is best known for the right hander that breaks into the harbour mouth. It's a powerful wave which jacks up pretty fast so you have to be fairly quick to your feet and not too intimidated by the idea of an air drop or just generally defying the laws of physics! After the drop there is a fast section which goes into the hollow inside. If you don't make the drop you can play pinball with the rocks! Aswell as the main right there is a left at lower tides. This is a bit faster and more of a wall - it's also good for a barrel or two. It doesn't get quite as busy as the right, or at least it didn't used to. More or less the first beach on the Lizard, Church Cove works in similar conditions to Porthleven. Facing south westerly it requires something between a northerly and an easterly wind to be offshore and a good sized westerly or any southerly swell to get going. 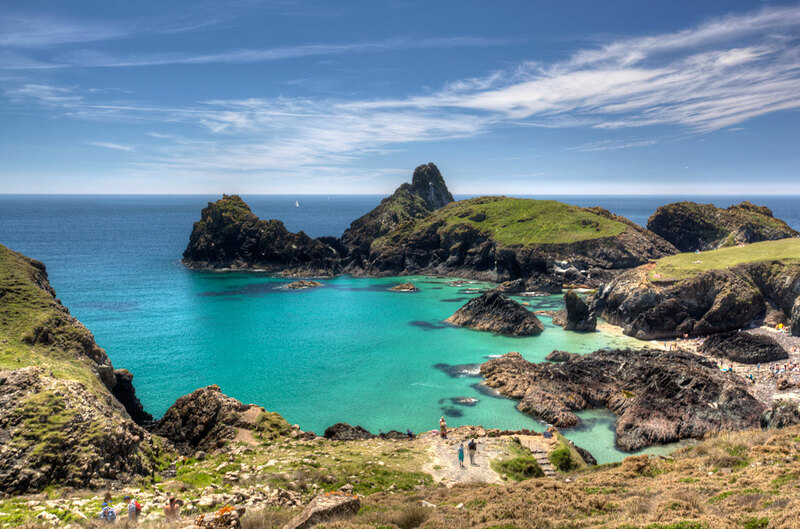 Kynance is well known as being one of the most beautiful coves in Cornwall, possibly owing to the combination of isolation, strange rock formations and clear, turquoise water. However, not many people regard it as a surf spot. Whilst not being the most consistent spot around, Kynance can get good waves. At mid tide on a smallish south or west swell with north or northwesterly winds there can be a great little wedgey left-hander. The wave comes in and rebounds of the cliff creating a really bowly, hollow section that bends presenting the surfer with the perfect launch ramp. On the downside, it only works within a narrow range of swell sizes and becomes maxed out pretty quickly. Oh, and it's at least half an hour from anywhere, which means it's more like an hour from most places! Situated on the wrong side of the far end of the Lizard, Kennack is a good drive from most places and is usually a last resort, having said that it can get wuite busy. Facing south-easterly means that Kennack is still cross offshore on a westerly wind. The fact that it does face south-east also means it takes a farily hefty swell to get it going. At low tide there is one long beach which is seperated into two as the tide comes in by the Caervarracks rocks. It's generally better to catch it on mid to low tide as it can fill up a bit towards the high. 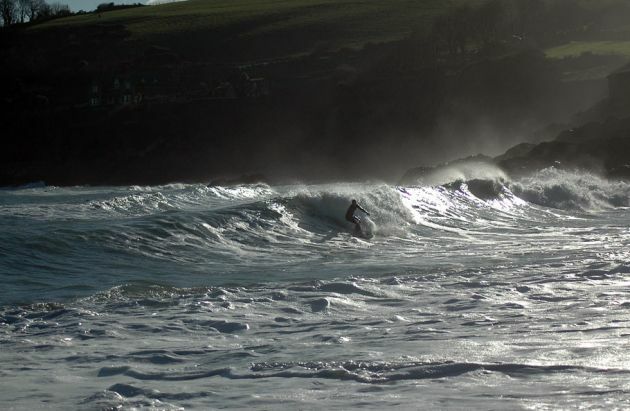 Not the South West's premiere surfing destination but the Falmouth area can produce some half decent waves. Being in the relatively sheltered armpit of the south coast there needs to be a big old swell with some south in it to even register here. Although having said that on a south-easterly swell (usually after a couple of days of howling easterly winds) the Falmouth area can be bigger than the North Coast. The main Falmouth beaches are Swanpool, Gyllngvase and Maenporth (about 2 miles west. There is also a reef between Swanpool and Gyllngvase that has been rumoured to be good on it's day. 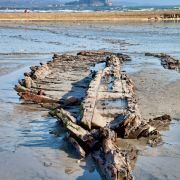 On the downside, as Falmouth is a university town the breaks can very quickly become full of driftwood as the student population pile in!